Abstract. Understanding the recent evolution of methane emissions in the Arctic is necessary to interpret the global methane cycle. Emissions are affected by significant uncertainties and are sensitive to climate change, leading to potential feedbacks. A polar version of the CHIMERE chemistry-transport model is used to simulate the evolution of tropospheric methane in the Arctic during 2012, including all known regional anthropogenic and natural sources, in particular freshwater emissions which are often overlooked in methane modelling. CHIMERE simulations are compared to atmospheric continuous observations at six measurement sites in the Arctic region. In winter, the Arctic is dominated by anthropogenic emissions; emissions from continental seepages and oceans, including from the East Siberian Arctic Shelf, can contribute significantly in more limited areas. In summer, emissions from wetland and freshwater sources dominate across the whole region. 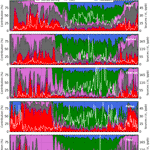 The model is able to reproduce the seasonality and synoptic variations of methane measured at the different sites. 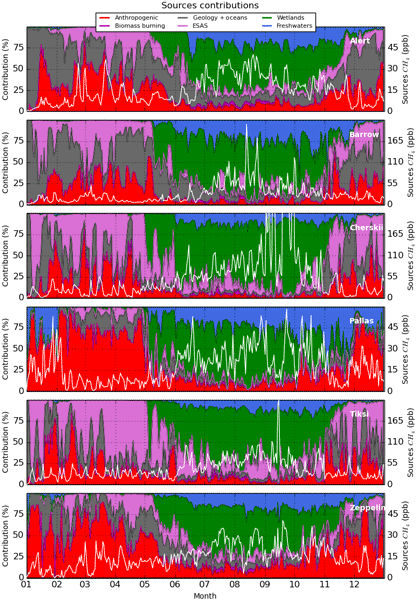 We find that all methane sources significantly affect the measurements at all stations at least at the synoptic scale, except for biomass burning. In particular, freshwater systems play a decisive part in summer, representing on average between 11 and 26% of the simulated Arctic methane signal at the sites. This indicates the relevance of continuous observations to gain a mechanistic understanding of Arctic methane sources. Sensitivity tests reveal that the choice of the land-surface model used to prescribe wetland emissions can be critical in correctly representing methane mixing ratios. The closest agreement with the observations is reached when using the two wetland models which have emissions peaking in August–September, while all others reach their maximum in June–July. Such phasing provides an interesting constraint on wetland models which still have large uncertainties at present. Also testing different freshwater emission inventories leads to large differences in modelled methane. Attempts to include methane sinks (OH oxidation and soil uptake) reduced the model bias relative to observed atmospheric methane. The study illustrates how multiple sources, having different spatiotemporal dynamics and magnitudes, jointly influence the overall Arctic methane budget, and highlights ways towards further improved assessments. How to cite: Thonat, T., Saunois, M., Bousquet, P., Pison, I., Tan, Z., Zhuang, Q., Crill, P. M., Thornton, B. F., Bastviken, D., Dlugokencky, E. J., Zimov, N., Laurila, T., Hatakka, J., Hermansen, O., and Worthy, D. E. J.: Detectability of Arctic methane sources at six sites performing continuous atmospheric measurements, Atmos. Chem. Phys., 17, 8371-8394, https://doi.org/10.5194/acp-17-8371-2017, 2017. Atmospheric methane simulations in the Arctic have been made for 2012 and compared to continuous observations at six measurement sites. All methane sources significantly affect the measurements at all stations, at least at the synoptic scale, except for biomass burning. An appropriate modelling framework combined with continuous observations of atmospheric methane enables us to gain knowledge on regional methane sources, including those which are usually poorly represented, such as freshwater.